A few weeks ago Jan created this custard. I thought it would go well as a dessert for my ham dinner tonight. As usual I have to add a few twists. 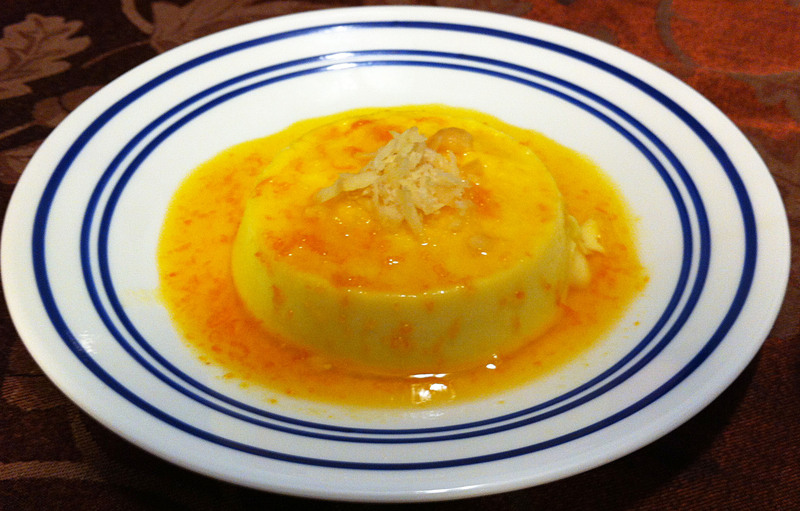 Mexican flan usually comes covered with a caramel sauce. This gave me the idea of topping Jan’s custard with my Ultimate Micro Orange Marmalade. I have this picture in my mind of perfect little custards, dripping with sweet orange marmalade. Eilene suggested that, since this was an Hawaiian theme, I should use macadamia nuts, instead of nutmeg. I used my micoplane zester on two whole nuts to mix into the eggs. I also used a sharp knife to turn five more nuts into shavings to top the finished custards. After Dinner Note: This dish turned out just as I had pictured it. The fine shreds of the micro marmalade did not leave large chunks of rind and created a very pretty effect. The shaved nuts gave it just the right amount of contrasting texture. 1. Put the eggs in a small bowl and whisk in the sugar and a quarter teaspoon of nutmeg. Reserve this mixture until later. Tip: Many recipes call for using just the egg yolks in making custards; that is not our practice. 2. Put the milk and cream into a medium sauce pan and heat until just steaming. 3. Remove the pot from the heat and whisk in the egg mixture. 4. Spray the custard cups with cooking spray and put one half tablespoon of marmalade in each cup. 5. Pour the egg mixture into the custard cups and place them into a larger baking pan. 6. Pour boiling water into the baking pan until it is half way up the sides of the custard cups. Tip: Be careful not to splash the hot water into the custard cups. 7. Place the baking pan in a 300° F oven for about 45-50 minutes, until done and remove the cups from oven and water bath. Tip: Check the custards after 40 minutes. They ares done when the top has completely set, but still has just a bit of jiggle to it. We used to cook the custard until a toothpick came out clean, but we have learned that this means that it is overdone and leads to a tough custard. If you make this custard in a single bowl add 5-10 minutes to the cooking time. 8. Run a thin knife around the edges of each custard cup and invert them over individual desert plates. Tip: With the custard cup up right, put the dessert plate on top. Invert both in one quick motion, so that the plate is on the bottom. The custard will fall out of the cup onto the plate. Remove the cup and your custard is plated in a pool of orange sauce. Note: I did this while the custards were still hot and the jam ran down as a thin sauce covering the plate, just as I had planned. Eilene pointed out that, if you wait for the custards to cool more the jam would thicken and more of it would stay on top of the custard. 9. Garnish the custards with shaved macadamia nuts. 10. You may serve the custards warm or cold, but it is best slightly warm. Tip: If you have made the custard more than an hour ahead of when you plan to serve it, it is a good idea to put it in the refrigerator. Twenty seconds on high in the microwave will warm it enough to serve, without overcooking it.